The Best Real Estate Pricing and Marketing Software Available! ​Get $$ For Your Projects, and Much More! Calculate Your Maximum Allowable Offer. Determine the max amount you should pay for any deal and avoid overpaying. Calculate the feasibility of a real estate rehab project and evaluate multiple exit strategies. Quickly find out the best financing options, cost of money, and potential profit for any deal! ​Market your wholesale deal like a pro! Create effective marketing materials that sell the deal for you. Tailor your marketing to house flippers or landlord investors. Blast your deal flyers from your phone directly to social media, via text, or via email! Publish your deal on our "Find Deals" site and have thousands of buyers nationwide compete for your deals! ​Line up private, hard money or bank financing like a pro! Blow your lenders away with professional deal funding pitches generated with a few clicks of a mouse! These deal funding presentations will get your project funded and make you look like a seasoned professional! Premium Members can also access our in-platform lenders! The FREE Rehab Valuator software shows you which renovations will make you money and which ones to avoid. 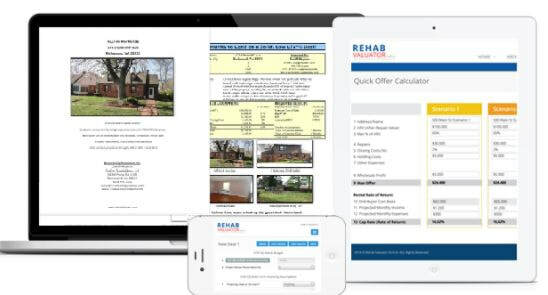 The software removes all the guess work and quickly figure the numbers needed for a successful rehab deal on residential and commercial properties. It'll keep you within budget and focused on your profit margin. The RehabValuator software will help you control costs and stay on schedule. It evaluates properties, quickly determines the repair costs, calculates labor and construction materials, manages contractors and gets your rehab properties completed without headaches. No heavy lifting, instantly get accurate number crunching with detailed reports. And don't worry - it's easy to use... No special computer knowledge required. Download it and put the software to the test. We know you'll love it too. There's also a members area with case studies, resources and video tutorials. If you're rehabbing real estate or wholesaling to those that do, then this is the software for you. With the Rehab Valuator you'll look like a pro and gain instant credibility. Don't waste another moment calculating rehab cost again. Create your FREE Rehab Valuator Lite Software account! You'll get instant access to this powerful cloud-based software, detailed video tutorials and real-life investing case studies! Hit the big orange button below and get it NOW.